1 A None No Power Seat 1 A has more legroom with a slightly reduced seat width. This seat has no window. 1 B None No Power Seat 1 B has more legroom with a slightly reduced seat width. This seat has no window. 2 A None No Power Seat 2 A is a standard Economy seat. 2 B None No Power Seat 2 B is a standard Economy seat. 3 A None No Power Seat 3 A is a standard Economy seat. 3 B None No Power Seat 3 B is a standard Economy seat. 4 A None No Power Seat 4 A is a standard Economy seat. 4 B None No Power Seat 4 B is a standard Economy seat. 5 A None No Power Seat 5 A has slightly less legroom. 5 B None No Power Seat 5 B has slightly less legroom. 6 B None No Power Seat 6 B is a standard Economy seat. 7 B None No Power Seat 7 B is a standard Economy seat. 8 B None No Power Seat 8 B is a standard Economy seat. 9 A None No Power Seat 9 A has slightly less legroom and does not recline. 9 B None No Power Seat 9 B has slightly less legroom and does not recline. These aircrafts are operated by Air Georgian, Central Mountain Air, and EVAS on behalf of Air Canada for very short-haul domestic services. As there is no cabin crew, there is no inflight services or amenities aboard. Seat 2A is probably the best seat on this plane. Our aircraft was painted with an EVAS livery and the safety announcements were generic, non-air Canada safety announcements which was very interesting. It was a full flight and they turned up the heat very very high so I had to blast my personal vent in my face to keep cool. I loved being able to see the movements of the pilots and see the takeoff and landing out of the front windows during the flight. This plane is not modern nor comfortable but if you like planes, this is a super unique commercial flying experience that I loved very much. It is true that there is reduced legroom as measured by the distance between your seat and the one in front of you, but that's just the beginning of the problems. There is a hump under seat 4 to accommodate the landing gear, which precludes fully stowing your carry-on under the seat, which cuts into your legroom even more. Being 6'1, I had nowhere to put my legs (or my carry-on). I'd suggest this row be marked as "bad" instead of "be aware"
Great seat on a short flight. Halifax to Charletown. Was able to watch landing through cockpit window. 25 minute flight. No problems at all, like flying in the old days when the pilot/s didn't close the cockpit door and you could right onto their instrument panels and coming into land at Calgary the runway lit up Good fun! 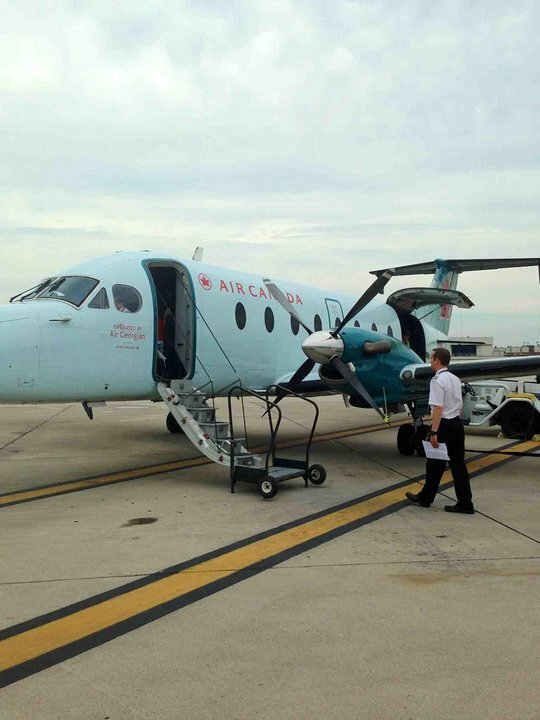 I flew from Hartford to Toronto on this miniscule plane. Unfortunately, i was seated in 4A, which is right next to the propeller and EXTREMELY noisy. Another weakness was that I could barely fit in my seat (6' 3" in fantastic shape with big biceps)!!! Don't ever fly this route unless you REALLY need to! I think this is the best seat on the plane, especially for av-geeks. You get a good window view (1A has none), and provided the person in 1A isn't extra tall or wide, you can see right into the cockpit and out the windscreen as there is no cockpit door. Upon landing you can watch the final approach and touch-down as the pilot sees it...a rare experience on an airliner. Once the plane touches down you're among the first off the plane. 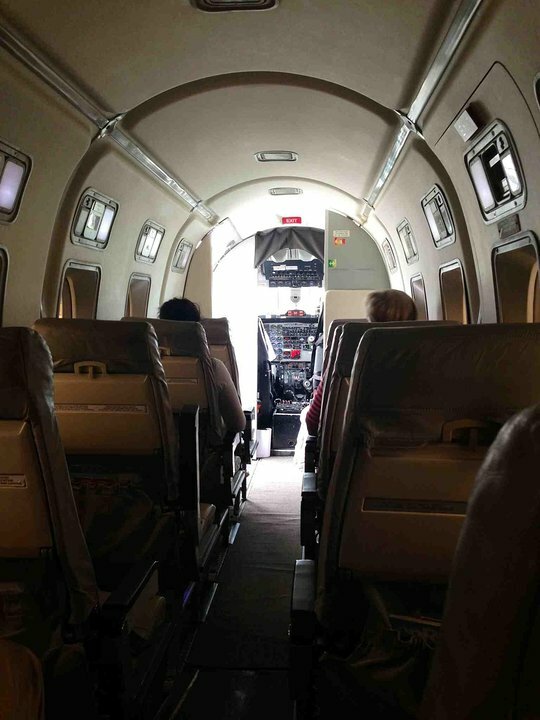 These planes don't have much in the way of legroom or amenities, but it's typically a short trip so my advice is just try to enjoy the experience. 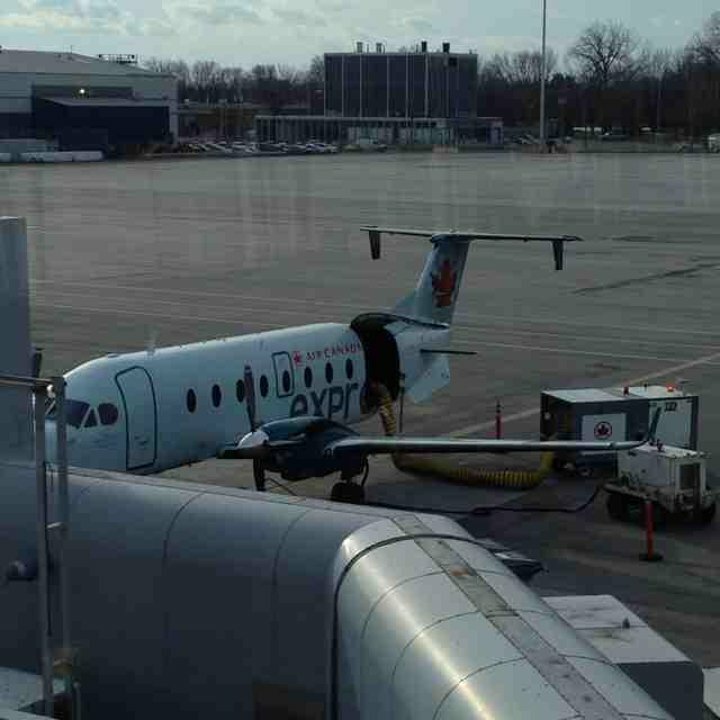 I love this airplane because most flights on Air Canada Express's Beech 1900 are not full. The seat in front of you reclines forward so your legs can lie flat on the seat in front of you. I actually didn't mind the seat. This aircraft flys to my home airport so I fly this plane alot and the row 9 seats are my seat of choice for one you get a good view outside the window your not view is not obstructed by the wing or the engine. Second despite the seat not reclining I haven't had any trouble falling asleep on the flights I take and third the flight I usually take on this aircraft is only a half hour long so there really isnt no need to recline the seat anyway by the time you get comfortable you are descending into our destination anyway. 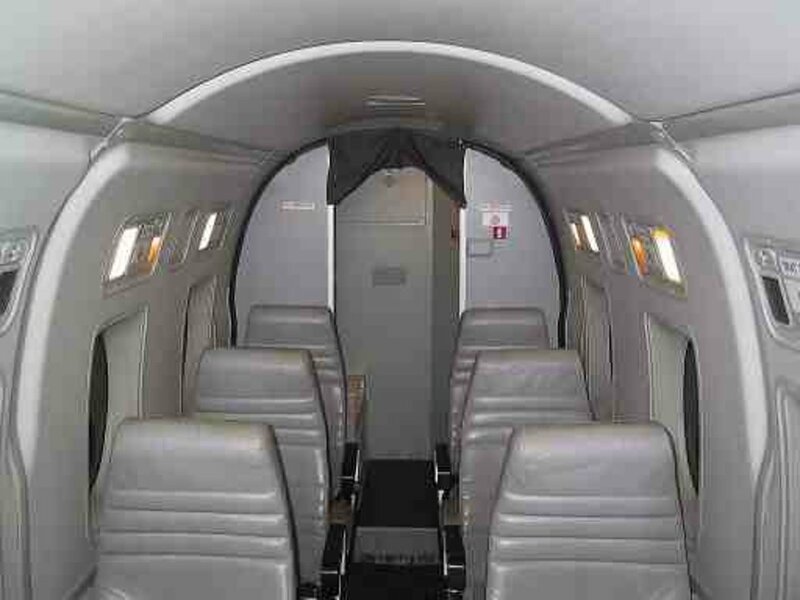 Air Canada flies 1 versions of Beech 1900D.